Details: 3 BR, 4 BA, Orange Beach Condo, 1,955+/- sq. 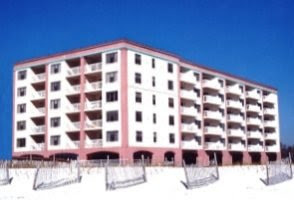 ft.
Info: Orange Beach Alabama Condo For Sale at Phoenix West II. Non Rental Immaculate north facing condo with all the upgrades. Granite counter tops, stainless steel appliances, marble backsplash, chair rail in halls, cabinets over the wetbar, crown molding, tile throughout, a must see. Furnishings by Posh and Malouf including an electric reclining leather sofa. Details: 4 BR, 4 BA, Orange Beach Condo, 1,910+/- sq. ft.
Info: Orange Beach Alabama Condo For Sale at Porto del Sol. Rare 4 bedroom/4 bath waterfront residence with deeded boat slip and 10k lb. motorized remote control lift at Porto Del Sol. Stunning east corner unit featuring direct bay views, stainless steel appliances, granite countertops, nice master suite with jetted tub and walk-in spa style shower, new carpet, bamboo flooring and freshly painted.